Hey thanks :D, I didn't have time unfortunately. - I made the full model in blender and rigged it. - Brought it into unity then de-parented each bone from its hierarchy. -Rebuilt the bone structure with unity configurable joints and colliders. Now the model flops around. -If you want animations you create a sort of reference dog that is just a straight model that plays animations. You then have a script on each bone of your stretchy dog which copies the position of each reference bone. Basically it just copies what the animation model is doing. - If you do it like this the stretching becomes a function of the joints. The main problem is that the colliders don't stretch, I have a convoluted theory for how I might solve this but for now I just disabled stretching. Also I forgot to make a post about the last thing I did on this. I made this segment adding thing which adds new bits to dog, it gets pretty buggy but I though it was cool. In the gif its just adding new ones as I hit R rather than for an actual reason but you get the picture. Also they are all blue, they can be any color but for testing its just blue. Probably not, though we'll see. Iv got some other stuff going on but if I can sort it out I might be able to get something in. Unfortunately i'm not going to be able to finish this. Really bummed but I don't want to put something half assed up. Been having some personal issues and missed a bunch of time. Also made some things I ended up removing so with 6ish days left I don't know how well this going to go... Still feels a bit rudderless as far as the actual goal of the game goes. I had wanted to do a sort of physics based adventure thing where you help characters and spread happiness. I don't know though.. it doesn't seem to be clicking. I think I might try something a little more straight forward. I have this mechanic where a objects can be infected with sadness which changes color pallette and maybe warps the model(not pictured). Dog must eat all the things spreading sadness. Dog must eat all things happy and leave the world a dark husk. In either case dog is an interloper, driven by the players competitiveness to consumes it all . This way itd be more straightforward and probably funner, I could still include some of the stuff I wanted but tangentially too. btw the gifs sped up. First thing is a rocket you can pick up and use, second is a weird flower power up. Both can launch you into space and serve no purpose whatsoever. Dog's epic bounce at the end there was because of a glitch but it was beautiful so I left it in. Also I got the world map working which I kinda like, though it needs a little ui dot in the middle or something. Anyway ramble over, typing this out its become a bit clearer. I gotta pull it together and get something done. Didnt get everything I wanted to done today, however knocked a few things over. Here's a gif of some clouds I added and a better depiction of size. Still don't know what I want to do for some pretty core mechanic stuff so who knows how this is going to turn out haha. At the very least it should be fun exploring the world with a friend. Got the Dog model done and in game. Includes wild physic stretching and dangerously floppy ears. Also implemented it with some pre existing stuff like the trees/junk, thought bubble thing and a spherical world. One immediate problem is that the collision does not follow the mesh which means as doggo stretches the collider segments remain the same size. This means if stretched doggo's torso will pass through things. No solution comes to mind so i'm putting it off for now. "Two dogs that can’t be separated? Delicious meat or dangerous bombs? This way or that way? Play with your friend/sibling/significant other/enemy against each other or cooperatively in this revolutionary game, where you can do both!" 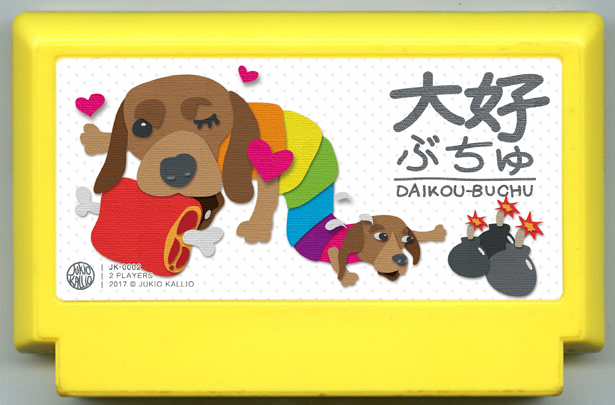 Oh hey y'all, iv chosen Jukio Kallio's great cover/idea Daiko - Buchu. I don't think ill follow the description 100% and instead take the core idea of two conjoined antagonistic (but perhaps cooperative?) players and go from there. Coincidentally I have been working on a similar little project called "Wormo the tortured one" which featured a worm rather than a dog so i'll probably lift some assets from that. haha so I guess this could be subtitled "Doggo the tortured one"
Anyway good luck everyone can't wait to see what gets made. This was bizarre to play being as I made my game in unity, my brain slotted into familiar territory when I hit that play button. Clever concept, and fun to play. Really good job !! I really dug(ha ha) this. The body part swap out stuff is cool and the spelunky influences work great. Cool intro too. One criticism would be that movement was a bit floaty but otherwise this was sweet. I like the weird winged bear thing. I forgot to leave a thing here. Reaally good. Play it humans. Just beat it! I didnt have to use the skip either, for whatever reason my brain was ready. The narrative is fantastic and I love its combination with these short puzzles. My criticism would be that the puzzles can be difficult to know what to do or are a little random. Maybe a UIhint or something would be enough, particularly the first one. Also while I think the art works and has its own lofi charm I reckon this paired with some hand drawn stills could be really effective. I really like the minimal sound design, the ambient noise works great and the voice over is sweet. Overall this is one of my favourites, a wee concise narrative paired with little taster puzzles... dope. I want to play this but I dont have an Android or person to play with. I'm really hoping the thumbs stream this. This walls mortar work was subpar and the filthyrobot at the door wouldn't stop moaning. For real though nice job. I played against myself for a moment, wish I had friends haha. Im hoping thumbs stream this, it seems like it could be a ton of fun. I was going to leave a negative comment regarding the first few walls but after the third the quality improved dramatically. If your wall is unsatisfactory hit x for a new one. A buy for sure. I cant for the life of me beat the first puzzle, its destroying me haha. I really wish I could, I love the little bit of narrative you start with. Ill return again in future and see if I can progress. Im playing this right now and I love it. The dialog sections are very amusing, puzzles satisfying and the art/sound generally great.I rate these dogs. I really do. Edit: I forgot to say, a skip dialog option would be sweet). Im playing this right now and I love it. The dialog sections are very amusing, puzzles satisfying and the art/sound generally great. I rate these dogs. I really do. One of my favs, weird and unexpected. Upward thumbs for... whatever this is. Yeah i'm having issues with half the screen being cut off. Also there's some audio stuff, the snoring is really loud. Edit: I checked the main page and read the bit about being able to look around with WASD, id already tried this but it was during the intro/first bit so I assumed it didn't work. I reckon a ui box or something might help. Haha amusing game. I never want to sit next to a sleeping gobler, or a business guy. Nice job y'all.